The Epistle to the Hebrews, or Letter to the Hebrews, or in the Greek manuscripts, simply To the Hebrews ( Πρὸς Ἑβραίους) is one of the books of the New Testament. The text is traditionally attributed to Paul the Apostle, but doubt on Pauline authorship in the Roman Church is reported by Eusebius. Modern biblical scholarship considers its authorship unknown, perhaps written in deliberate imitation of the style of Paul. Although the writer's style reflects some characteristics of Paul's writing, there are some differences. Scholars of Greek consider its writing to be more polished and eloquent than any other book of the New Testament, and "the very carefully composed and studied Greek of Hebrews is not Paul's spontaneous, volatile contextual Greek". The book has earned the reputation of being a masterpiece. It has also been described as an intricate New Testament book. Scholars believe it was written for Jewish Christians who lived in Jerusalem. Its purpose was to exhort Christians to persevere in the face of persecution. At this time, certain believers were considering turning back to Judaism (the Jewish system of law) to escape being persecuted for accepting Christ as their saviour, now following this system of grace (saved by Jesus' sacrifice on the cross). The theme of the epistle is the doctrine of the person of Christ and his role as mediator between God and humanity. The epistle opens with an exaltation of Jesus as "the radiance of God's glory, the express image of his being, and upholding all things by his powerful word". [1:1–3] The epistle presents Jesus with the titles "pioneer" or "forerunner", "Son" and "Son of God", "priest" and "high priest". By the end of the first century there was no consensus on the author’s identity. Clement of Rome, Barnabas, Paul the Apostle, and other names were proposed. Others later suggested Luke the Evangelist, Apollos, or his teacher Priscilla as possible authors. "In the epistle entitled To The Hebrews the diction does not exhibit the characteristic roughness of speech or phraseology admitted by the Apostle [Paul] himself, the construction of the sentences is closer to the Greek usage, as anyone capable of recognising differences of style would agree. On the other hand the matter of the epistle is wonderful, and quite equal to the Apostle's acknowledged writings: the truth of this would be admitted by anyone who has read the Apostle carefully... If I were asked my personal opinion, I would say that the matter is the Apostle's but the phraseology and construction are those of someone who remembered the Apostle's teaching and wrote his own interpretation of what his master had said. So if any church regards this epistle as Paul's, it should be commended for so doing, for the primitive Church had every justification for handing it down as his. Who wrote the epistle is known to God alone: the accounts that have reached us suggest that it was either Clement, who became Bishop of Rome, or Luke, who wrote the gospel and the Acts." In the 4th century, Jerome and Augustine of Hippo supported Paul's authorship: the Church largely agreed to include Hebrews as the fourteenth letter of Paul, and affirmed this authorship until the Reformation. Scholars argued that in the 13th chapter of Hebrews, Timothy is referred to as a companion. Timothy was Paul's missionary companion in the same way Jesus sent disciples out in pairs. Also, the writer states that he wrote the letter from "Italy", which also at the time fits Paul. The difference in style is explained as simply an adjustment to a distinct audience, to the Jewish Christians who were being persecuted and pressured to go back to traditional Judaism. Many scholars now believe that the author was one of Paul's pupils or associates, citing stylistic differences between Hebrews and the other Pauline epistles. Recent scholarship has favored the idea that the author was probably a leader of a predominantly Jewish congregation to whom he or she was writing. Because of its anonymity, it had some trouble being accepted as part of the Christian canon, being classed with the Antilegomena. Eventually it was accepted as scripture because of its sound theology, eloquent presentation, and other intrinsic factors. :431 In antiquity, certain circles began to ascribe it to Paul in an attempt to provide the anonymous work an explicit apostolic pedigree. The original King James Version of the Bible titled the work "The Epistle of Paul the Apostle to the Hebrews". However, the KJV's attribution to Paul was only a guess, and is currently disputed by recent research. Its vastly different style, different theological focus, different spiritual experience, different Greek vocabulary – all are believed to make Paul's authorship of Hebrews increasingly indefensible. At present, neither modern scholarship nor church teaching ascribes Hebrews to Paul. A.J. Gordon ascribes the authorship of Hebrews to Priscilla, writing that "It is evident that the Holy Spirit made this woman Priscilla a teacher of teachers". Originally proposed by Adolf von Harnack in 1900, Harnack’s reasoning won the support of prominent Bible scholars of the early twentieth century. Harnack believes the letter was written in Rome – not to the Church, but to the inner circle. In setting forth his evidence for Priscillan authorship, he finds it amazing that the name of the author was blotted out by the earliest tradition. Citing Chapter 13, he says it was written by a person of "high standing and apostolic teacher of equal rank with Timothy". If Luke, Clemens, Barnabas, or Apollos had written it, Harnack believes their names would not have been obliterated. Believing the author to have been Priscilla, Ruth Hoppin posits that the name was omitted either to suppress its female authorship, or to protect the letter itself from suppression. However, there is no way to prove the actual dating of this writing, even from within the internal structure of the writing. Throughout the writing, all mentions of the priestly acts of worship are connected to the tabernacle in Sinai, as built by Moses, with no mention of the temple in Jerusalem. An argument for a later date of the Hebrew text can be assumed due to the absence of any mention of the temple in Jerusalem. If the Hebrew writer composed this message after the first century it would be entirely possible that the destruction of the Jerusalem temple and that of the city of Jerusalem would not be relevant to the writer. Thus, some academic scholars[who?] hold to a much later date of composition to the Hebrew writing. Scholars[who?] have suggested that Hebrews is part of an internal New Testament debate between the extreme Judaizers (who argued that non-Jews must convert to Judaism before they can receive the Holy Spirit of Jesus' new covenant) versus the extreme antinomians (who argued that Jews must reject God's commandments and that Jewish law was no longer in effect). James and Paul represent the moderates of each faction, respectively, and Peter served as moderator. 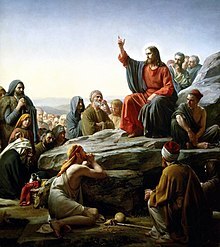 It sets before the Jew the claims of Christianity – to bring the Jew to the full realization of the relation of Judaism to Christianity, to make clear that Christ has fulfilled those temporary and provisional institutions, and has thus abolished them. This view is commonly referred to as Supersessionism. Some scholars today believe the document was written to prevent apostasy. Some have interpreted apostasy to mean a number of different things, such as a group of Christians in one sect leaving for another more conservative sect, one of which the author disapproves. Some have seen apostasy as a move from the Christian assembly to pagan ritual. In light of a possibly Jewish-Christian audience, the apostasy in this sense may be in regard to Jewish-Christians leaving the Christian assembly to return to the Jewish synagogue. The author writes, "Let us hold fast to our confession". [4:14] The epistle has been viewed as a long, rhetorical argument for having confidence in the new way to God revealed in Jesus Christ. Hebrews is a very consciously "literary" document. The purity of its Greek was noted by Clement of Alexandria, according to Eusebius (Historia Eccl., VI, xiv), and Origen of Alexandria asserted that every competent judge must recognize a great difference between this epistle and those of Paul (Eusebius, VI, xxv). Hebrews contains many references to the Old Testament – specifically to its Septuagint text. We may sum up our author’s Christology negatively by saying that he has nothing to do with the older Hebrew messianic hopes of a coming Son of David, who would be a divinely empowered human leader to bring in the kingdom of God on earth; and that while he still employs the figure of a militant, apocalyptic king... who will come again..., this is not of the essence of his thought about Christ. Positively, our author presents Christ as divine in nature, and solves any possible objection to a divine being who participates in human experience, especially in the experience of death, by the priestly analogy. He seems quite unconscious of the logical difficulties of his position proceeding from the assumption that Christ is both divine and human, at least human in experience although hardly in nature. If the humanity of Jesus is an important theme for Hebrews, how much more is Jesus’ deity. While this theme of exaltation is asserted ‘in many and various ways’ we shall content ourselves by considering how the writer addresses this theme by asserting Jesus’ superiority to a) angels, and b) Moses. The first chapter of Hebrews stresses the superiority of the Son to the angels. The very name ‘Son’ indicates superiority. This exaltation theme, in which the Son is contrasted with the angels (1:4), is expanded in the following string of OT quotations (1:5-13). While some have understood the catena as referring primarily to Christ’s pre-existence, it is more likely that the verses should be understood, ‘as a Christological hymn which traces the entire Christ event, including the pre-existence, earthly life, and exaltation of Christ’. The overall structure of the catena seems to point to exaltation as the underlying motif... At least it may be concluded that the superiority of the Son is demonstrated by this comparison/contrast with angels. Peter Rhea Jones has reminded us that ‘Moses is not merely one of the figures compared unfavourably to Jesus’; but rather, ‘Moses and Jesus are yoked throughout the entirety of the epistle’. Allowing that Moses is much more than a ‘whipping boy’ for the author, the fact remains that the figure Moses is utilized as a basis for Christology. While there are several references to Moses, only two will be needed to demonstrate Jesus’ superiority. The first passage to be considered is Hebrews 3:1-6. D’Angelo and others regard the larger context of this passage (3:1-4:16) to be the superiority of Christ’s message to the Law. While the comparison between Jesus and the angels is based on a number of OT citations, the comparison of Jesus and Moses turns on a single verse, Nu. 12:7. Like the angels (1:14), Moses was a servant who witnessed, as it were, to the Son. In other words, ‘faithful Sonship is superior to faithful servantship’. The Son is once again exalted. The exaltation theme finds expression in a more opaque way at 11:26. Here in the famous chapter on faith Moses is said to count ‘abuse suffered for the Christ greater wealth than the treasures of Egypt’. The portrait of Moses drawn here is that of a martyr, and a Christian martyr at that. In effect, Moses joins that great cloud of witnesses who looked to Jesus as pioneer and perfecter of faith. Once again, Christ’s superiority is asserted, this time over Moses and the entire Mosaic epoch. In summary, the writer [of Hebrews] stressed the Sonship of Jesus and expressed it in a three-stage Christology of pre-existence, humanity, and exaltation. ^ "some have rejected the Epistle to the Hebrews, saying that it is disputed by the church of Rome, on the ground that it was not written by Paul." Eusebius, Hist. Eccl. 3.3.5 (text); cf. also 6.20.3 (text). ^ Alan C. Mitchell, Hebrews (Liturgical Press, 2007) p. 6. ^ Bart D. Ehrman, Forged: Writing in the Name of God – Why the Bible's Authors Are Not Who We Think They Are (HarperCollins, 2011) p. 23. ^ Clare K. Rothschild, Hebrews as Pseudepigraphon: The History and Significance of the Pauline Attribution of Hebrews (Mohr Siebeck, 2009) p. 4. ^ Duling, C. Dennis (2003). The New Testament : history, literature, and social context (4th ed.). Belmont, CA: Thomson/Wadsworth. p. 281. ISBN 0155078569. OCLC 52302160. ^ Utley, R. J.: The Superiority of the New Covenant: Hebrews. Bible Lessons International; Marshall, Texas: 1999, Volume 10, p. 1. ^ Oegema, Gerbern S. "You Are a Priest Forever" book review. Catholic Biblical Quarterly, Oct 2009, Vol. 71 Issue 4, pp. 904–05. ^ Utley, R. J.: The Superiority of the New Covenant: Hebrews. Bible Lessons International; Marshall, Texas: 1999, Volume 10, p. 3. ^ A. Louth ed. & G. A. Williamson trans. [Origen quoted in] Eusebius, The History of the Church (London: Penguin, 1989), 202 [book 6.25]. ^ "Eusebius Church History Book VI Ch 25 v 14". Newadvent.org. Retrieved 19 November 2010. ^ a b c Fonck, Leopold. "Epistle to the Hebrews". The Catholic Encyclopedia. Vol. 7. New York: Robert Appleton Company, 1910. Web: 30 Dec. 2009. ^ Rhee, Victor (Sung-Yul) (June 2012). Köstenberger, Andreas, ed. "The Author of Hebrews as a Leader of the Faith Community" (PDF). Journal of the Evangelical Theological Society. 2. 55: 365–75. ISSN 0360-8808. Retrieved 2012-11-17. ^ Attridge, Harold W.: Hebrews. Hermeneia; Philadelphia: Fortress, 1989, pp. 1–6. ^ Ellingworth, Paul (1993). The New International Greek Testament Commentary: The Epistle to the Hebrews. Grand Rapids, MI: Wm. B. Eardmans Publishing Co. p. 3. ^ Adolph von Harnack, “Probabilia uber die Addresse und den Verfasser des Habraerbriefes, ” Zeitschrift für die Neutestamentliche Wissenschaft und die Kunde der älteren Kirche (E. Preuschen, Berlin: Forschungen und Fortschritte, 1900), 1:16–41. ^ See Lee Anna Starr, The Bible Status of Woman. Zarephath, N.J.: Pillar of Fire, 1955, pp 187–82. ^ Hoppin, Ruth; Bilezikian, Gilbert (2000). Priscilla's Letter. Lost Coast Press. ISBN 1882897501. ^ "Supersessionism | Theopedia". www.theopedia.com. Retrieved 2017-09-26. ^ See Whitlark, Jason, Enabling Fidelity to God: Perseverance in Hebrews in Light of the Reciprocity Systems of the Ancient Mediterranean World (PBMS; Carlisle: Paternoster Press, 2008). ^ Zupez, John (1973). "Salvation in the Epistle to the Hebrews". Bible Today Reader. Collegeville, MN: Liturgical Press. pp. 2590–2595. ^ Ehrman, Bart D. (2004). The New Testament: A Historical Introduction to the Early Christian Writings. New York: Oxford. p. 411. ISBN 0-19-515462-2. ^ "CATHOLIC ENCYCLOPEDIA: Epistle to the Hebrews". www.newadvent.org. Retrieved 2017-09-26. ^ Parsons, Mikeal (1988). "Son and High Priest: A Study in the Christology of Hebrews" (PDF). Evangelical Quarterly (60): 205–208.